AUNTS returns with an experiment in choreography, art, and collective living that culminates in live performance. camp2 brings together artists from assorted disciplines to work autonomously alongside each other to create an immersive dance/performance/party—a dynamic whole no more or less important than its individual parts. Tickets include an Art-B-Q dinner featuring a pig roast, and admittance to the performance. Artists include AORTA x AOMC, Anna Azrieli, Megan Byrne, Charlotte Gibbons, Jonathan Gonzalez, Ezra Holtzman, Nathalie Jonas, NIC Kay, Jennifer Kjos, Jillian Sweeney, Ash R.T. Yergens, and Jessie Young. 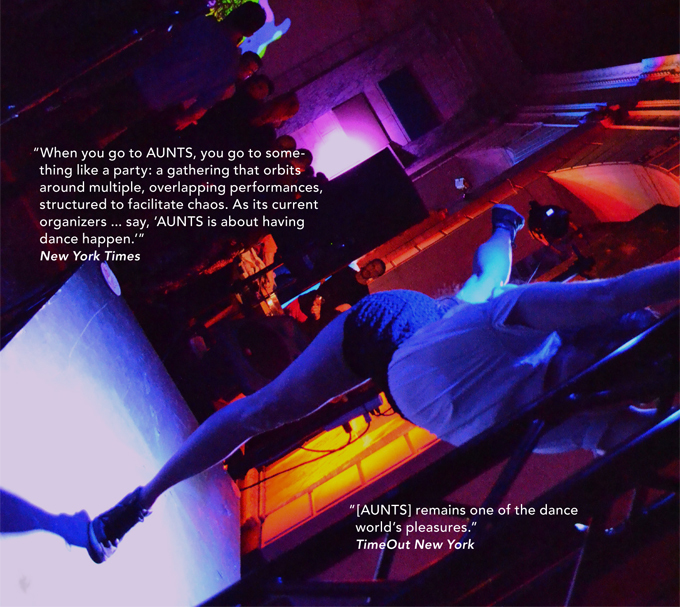 Founded by James Kidd and Rebecca Brooks in 2005 and organized by Laurie Berg and Liliana Dirks-Goodman since 2009, AUNTS is a roving platform for dance and performance guided by core principles of collectivity, cooperation, and sharing. Adapting to any architecture, AUNTS generates a constantly shifting environment where artists simultaneously produce/present work while audiences engage at will, creating their own experiences through chance encounters. AUNTS is a program of Before Your Eyes Inc.